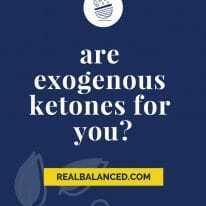 The main goal in moving to a ketogenic diet is to exhaust your body of its previous energy source, glucose, and to transition your body to instead rely on ketones for fuel. Making the jump headfirst into this type of diet can be difficult, no one is denying that; but when it comes to your health, you gotta do what you gotta do! With the below tips discussing macro tracking and conscious effort on your part, there’s nothing you can’t do! Real Balanced is here to help you along the way. If you have any questions we don’t address below, feel free to leave your comments below! High Fat – 60%-80% of total calories come from fat. Moderate Protein – 15%-35% of total calories come from protein. Low Carbohydrate – 5% or less of total calories come from carbohydrates. 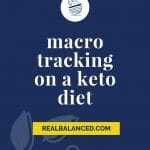 Everyone’s macro intake will be different based on your body type, but luckily, you can calculate your personal macros with this macro calculator to see what will work best for you, your goals, and your body weight/type! 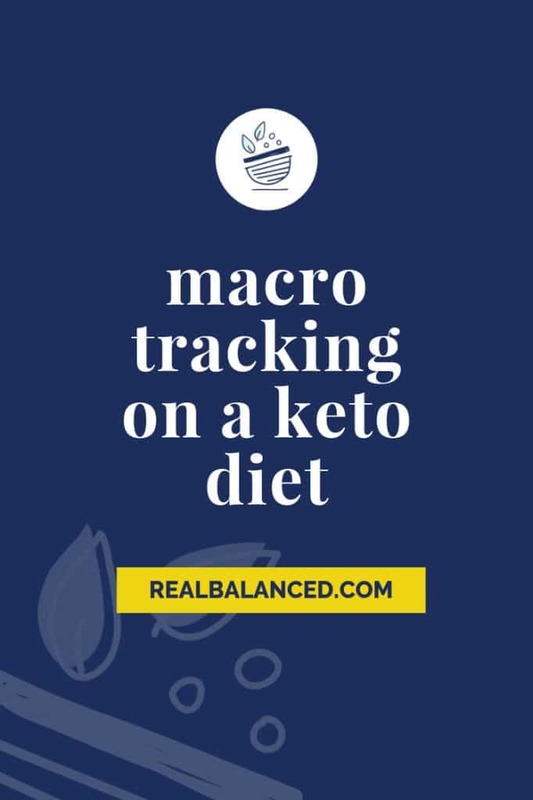 As you begin to track your macros and limit your carb intake, your body will deplete its supply of glycogen, transitioning your energy from a state of glycosis to ketosis. 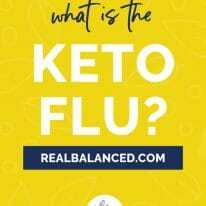 For more information on the basics and the benefits of a ketogenic diet, check out my ketogenic diet resource index! As you learn more about what you can and cannot eat and find your favorite recipes, eating will be much easier! Many keep their carb intake to under 40-50 grams of net carbs, but the ideal goal is for your intake to be below 20 grams of net carbs (the formula to calculate net carbs: total carb content – fiber – sugar alcohols = net carbs). To accurately track your food intake, you are going to need a food scale. I use this food scale, which I purchased from Amazon and it has served me well for the past few years. If, however, you want to be a little more lenient and aren’t looking to be “as accurate,” you can skip on the food scale and just do your best to guesstimate the weight of food. Personally, I suggest you weigh your food with a food scale for at least 6 months (you might be surprised to see just how much 2 tablespoons of nut or seed butter is!) and, once you have a good eye for it, you can start moving away from weighing everything. I used to weigh every morsel of food I ate, but I now can quite accurately look at food and know how many grams or ounces it weighs. Using this tactic allows me to still follow a macro-based ketogenic protocol, yet doesn’t require me to lug a food scale around with me. Going from eating a diet high in carbohydrates to a diet that contains less than 5% of calories coming from carbs may be a difficult transition, but, trust me, it can be done! When following a ketogenic diet, tracking your carbs, specifically your net carbs, is key. Because “dietary fiber does not have a significant metabolic effect” and, therefore, doesn’t lead to an insulin spike. Tracking net carbs versus total carbs allows for a much higher intake of many nutrient-dense foods like vegetables, nuts and seeds, and even chocolate! Additionally, it is important to note that sugar alcohols are calculated just like fiber (e.g., grams of sugar alcohol can be subtracted from total carbs). This is especially good to know if you’re like me and LOVE dessert! Low-carb sweeteners, like my favorite, monk fruit sweetener, contain 0 grams of net carbs per serving (4g total carbs – 4g sugar alcohols = 0g net carbs). Low-carb, high-fats is the basis of the ketogenic diet. Most people usually hone in on the “low-carb” part, completely forgetting about high-fats. For most diets, fats will account for upwards of 70% of your intake. This is a LOT! If following a nut-free diet and you want to incorporate something similar to nut butter, SunButter Sunflower Butter is a great option! The other main macronutrient that you want to monitor the most is protein, which will replace your intake of carbs. The protein converts to glucose, meaning that eating a LOT of protein is NOT conducive to a ketogenic diet. Staying on track with how much protein you consume is key, otherwise you will have troubles consistently staying in ketosis. If you prefer to use exact numbers, the generally accepted amount of protein to be consumed on a ketogenic diet is between 0.6 grams and 1.2 grams per pound of lean body mass. Those who are less active will be only need to consume around 0.6 grams, while those more active and athletic will be in the 0.9-1.2 grams range. Your main goal is to avoid foods filled with sugars and starch. There are a myriad of alternatives to all the foods listed in the graphic above. Heavy, starch-filled items should be altogether avoided. While bread, pasta, rice, and potatoes may taste good, there are plenty of keto-friendly alternatives to each of these! Soft drinks, sugary juices, and energy drinks full of sugar must also be eliminated from your diet. You probably don’t realize just how much sugar is in those things! And for those who love their ketchup and super sugary sauces and jams, I hate to break it to you: but these are not recommended for a ketogenic diet. 🙁 What you CAN have instead: mayonnaise, olive oil, aiolis, vinaigrette, and mustard. Milk is not recommended as lactose is processed by our bodies as sugar. If you love milk in your coffee, I’d suggest replacing that with heavy cream, butter, and/or coconut oil! Track your net carbs. Eat meats, veggies, and healthy fats. Stay away from sugary drinks, foods, and snacks, along with starch-filled food items. I believe in you! If you have any questions about more specific things you can or cannot eat, ask away below! 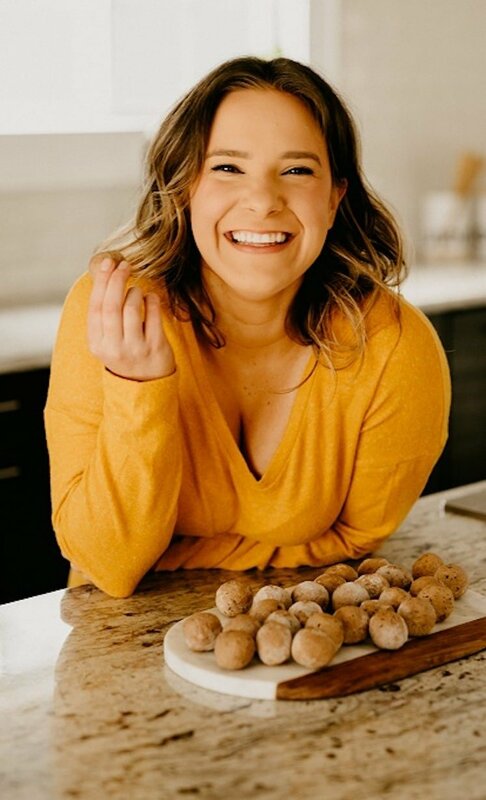 Click here to view all of my recipes to help you transition to a ketogenic diet! 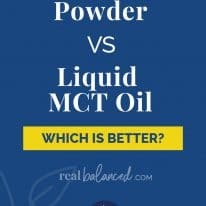 Should I count oils used for cooking towards total fat intake? Hi, Eva! Yes, you should. Everything you eat/drink should be calculated to ensure accuracy. I am still confused on how I know I am getting 70% Fat, 20% Protein and 5% Carbs. Do I need to basically track every item in a recipe? Write down each ingredients ‘DNA’ so to speak. I am unsure how to equate 70% Fat on a plate??? Yes, you need to track everything you eat and enter it into a calculator. I personally like the MyFitnessPal app. To accurately measure everything, a food scale is necessary. So, if you were going to make yourself a burger, you’d weigh the raw ground beef, the toppings you use (e.g., cheddar cheese, bacon, etc. ), and then enter all of that into the app. It will calculate what percentage of your daily macros you’ve consumed. Before you do any of that though, be sure you calculate your individualized macro amounts. Those percentages you mention are just general guidelines. I have been having issues with Greek yogurt each time i try to have it in a smoothie or by itself i feel acid refulx :/ Can i use regular yogurt instead with no fat? That’s totally up to you, but I probably personally wouldn’t, as regular yogurt is much higher in carbs due to the lactose content. My advice would be to altogether remove yogurt from your diet, especially if it’s causing reflux. Is Greek yogurt, then, eliminated b/c of lactose? And no fruit at all? Specifically berries (blue/black) ? Hi, Andrea! For the Greek yogurt, it would depend on the ingredients and the carb content. If you want to incorporate yogurt into your personal diet, I say, “go for it!” Just be sure to check that the carb content is low. As for fruit, berries can be included, as they are low in net carbs, however, be sure to not overdo it as the carb content will quickly add up! I love to eat blueberries and raspberries (they are both low in net carbs).